Accent UK's first ever True Believers. True Believers is one of those Comic Conventions that we'd heard plenty about over the last year or so, but had never been able to attend as it always clashed with something that we'd already committed to. This year then we were fortunate enough to be able too say 'Yes' and Saturday saw me doing my first solo Con for a very long time (in fact I'm not sure I've done one on my own before). The venue was Cheltenham Race Track which due to the magic that is GoogleMaps I found pretty easily. Getting in and set up was actually pretty painless and the helpers were all clued up and helpful, which is not always the case (they're always helpful but not always as clued up). So, there I was all badged up, finding my table was near the front, off loaded and set up within about 20 minutes of arriving. I'm not saying this is a record (although it might well be as I'm usually slowed down a bit by Colin, Gary or Jemma) but it felt so painless. were just arriving as I took this. One table meant a few changes and the need to leave some things at home but I was happy with the layout and ready for anything by the time the doors opened. I'd even remembered to bring my 'signing pen'. It was a nice Con. It was a rainy day but plenty of comic book enthusiasts turned up to make it a pretty good day. Introduced our work to a lot of new readers, chatting to some like minded creators I'd not seen before and sold some books. It was great meeting up with Andy Bloor, Mike Garley and Steve Tanner as always. Nice to see Jeremy Biggs (of the wonderful Metal Made Flesh) wandering around as a punter (thanks for the Early Grey Tea Jeremy .. life saver). ..but I loved it. Conor's art just gets better and better. I promised myself on reading this that I'll try my best to work with him one fine day, he's worth every penny. I had only one criticism of what is a very thought provoking book and that's that I think it should have been longer. Hey Lizzie, how about this being the sampler and you both building it out more? I'm not saying the ending was wrong, I'd just like to see more development of such a great concept. One of the great things about Cons are the little unexpected things that happen. I met Jo of Vault29 Comics, and online comic store dedicated to Small Press comics. What a great idea. 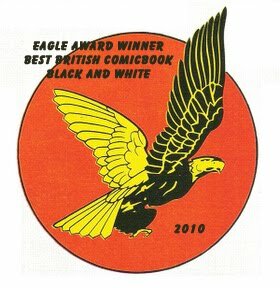 Somewhere to go and order all sorts from the talented people out there making their own comics. I gave Jo some copies of our books and hope he does well with it, I think it'll only be as successful as we make it and so it needs the people who are sold through his store to go and talk about it, spread the word. A great little A5, and the pack it came in included all sorts of goodies, equally interesting and well design and produced. I'm intrigued by his concept but you'll have to track his books down (on Vault 29) and find out for yourselves. So... True Believers ... we'll be back next year, thanks for putting on a great show.